Please note that you’ll need to sit the UCAT from 2020, not the UKCAT. You can read about the UKCAT to UCAT changeover here. An average UCAT score would normally be considered around 610 to 650, but this does vary year on year. Nevertheless, looking at previous years, we can get a rough idea of the score you’ll need to stand a chance of an interview or offer. At the moment, you’re probably quite stressed out, juggling entrance tests, personal statement and studying at the same time – so we’ve done the hard work for you! Liverpool processes applications in three stages. The first stage involves your academics. The top 9 GCSEs are scored, including English Language, Maths and the Sciences. A*/As are awarded 2 marks, and Bs awarded 1 mark. Those who meet or exceed Liverpool’s minimum requirements (normally 15 points), then advance to the second stage, where their UKCAT score is assessed. A score of 615 or higher was considered ‘competitive’ score 2018, 643 for 2017 entry and 625 for 2016 entry. Those with a Band 4 in the SJT will not be considered further. However, for international status applicants the SJT is not used. Then the students who make it through this stage will then be invited to the third stage, the interview. This year Liverpool will no longer be assessing Personal Statements in their selection process, but they will be used as part of the interview. There is no cut-off UKCAT score for East Anglia. Instead your UKCAT score is used alongside your GCSEs and predicted/achieved A-Levels. In previous years, academics have made up two thirds of selection, and UKCAT one third. This means strong academics may compensate for a low UKCAT score. For GCSE’s, top 9 subjects including English, Maths and two Sciences are scored, with points awarded for each A or A*. The SJT is then used alongside the interview score and the overall UKCAT score to rank and select students when making offers. The personal statement is not scored but is discussed at interview. At Hull York, UKCAT is used alongside GCSEs to select for interview. Those meeting Hull York’s minimum academic requirements are ranked based off their GCSEs, UKCAT and SJT, out of total of 85 points, with around the top half of the ranking invited to interview. The top 8 GCSEs are scored to give a maximum 30 points, the UKCAT up to 40 points and the SJT band up to 15 points. If you qualify for widening participation you may also receive an additional 15 points. You can find more information on this here. The personal statement is read, but not formally scored. 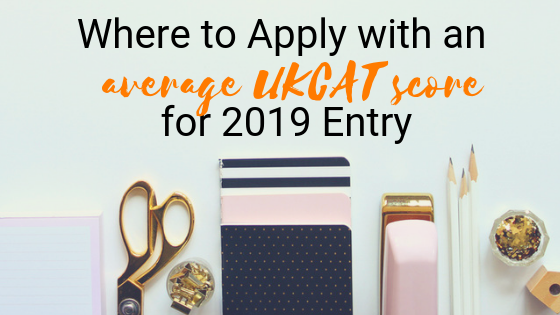 Although UKCAT makes up the largest part of selection for interview, the average UKCAT score for those interviewed was 663 for 2017 entry. Keep in mind this is the average, so those with very high scores will skew this average. The median UKCAT score of offer holders for 2015 entry was 680, this means 50% of offer holders scored 680 or less (the interquartile range was 62). The SJT plays a larger role which means your UKCAT score may not have to be as high. Once you are invited to interview, UKCAT score and GCSEs are forgotten about, with applicants scored at interview and ranked again. Students will undergo 2 x 10 minute interviews, plus a group exercise and a role play scenario. The SJT is then used again to contribute extra points to your interview score. Students ranked at the top will then receive an offer. This means if you have a Band 1 in the SJT, you would be walking into the interview with an immediate advantage. If your UKCAT is around 680 you stand a good chance, and even if it is less, if you did well on the SJT and have some good GCSEs then Hull York could be a good option. Selection for interview at Leicester is based on 50% academics, 50% overall UKCAT score. Each is scored out of a possible 32 points, giving a total of 64 points. Those with the most points are invited to interview. If you have predicted A-Levels, the top 8 GCSE qualifications are scored (including English Language, Maths and 2 Sciences). An A* (8/9) at GCSE is awarded 4 points, an A (7) 3 points and a B (6) 1 point. Graduates or those with achieved A-Levels have their academics scored differently, more info can be found here. For the UKCAT, you are allocated points for your overall score. A score of 3200 or above is given the maximum of 32 points. Then for every 50 points below this you will lose half a point. For example, a score between 3199 and 3150 results in 31.5 points. A score in the bottom two deciles is given a maximum of 16 points. You can see more about this here. The cut off score for interview was 53.5 for 2018 entry in students with predicted A levels. The same cut off for 2016 entry was 56.5 and for 2015 entry 59.5. You can find out more about these statistics here, including for graduate applicants and those with achieved A-Levels. Leicester states, ‘applicants with Band 4 in the Situational Judgement Test will be automatically rejected pre-interview’. For candidates deemed ‘borderline’ (near the points cut off), Leicester may take into account your ‘personal qualities’ by using your personal statement and reference. Leicester say on their website exactly how your academics and UKCAT are scored, so you can work out how many points you’d get before you apply! Since academics contribute 50%, there is not a UKCAT cut off score. Nevertheless, the higher your UKCAT scores, the better the chance of interview. In fact, the median UKCAT score of those given offers for 2015 entry was 682.5, and the lowest score accepted was 587.5! However, if applying with a UKCAT score like this you need to have impeccable academics.